So the New York Times story today is exactly wrong in the most important detail. The story reports on changes to policy, and in particular the introduction of the semi-protection policy. The headline and first paragraph of the story give the impression that today at Wikipedia, articles are protected and semi-protected, whereas in the past “anyone can edit”. This completely ignores the facts, which I explained to them in great detail. The facts are that protection as a policy has existed for years. Semi-protection was devised as a softer, more open approach. Rather than full protection, which means that no one can edit, we now increasingly use semi-protection, which allows people to continue to edit the article. Wikipedia is the encyclopedia that ‘anyone can edit,’ and this has become more true in recent months. In past years, Wikipedia was sometimes forced to protect some articles from editing, but recent software and policy development has allowed for articles which would have formerly been protected to be open for editing. Ah, well. I keep looking at the New York Times site, looking for the “edit this page” button to correct the errors, but of course, that’s impossible. Wikipedia is soon to enter our 5th year online, and I want to take a moment to ask you for your help in continuing our mission. Wikipedia is facing new challenges and encountering new opportunities, and both are going to require major funds. 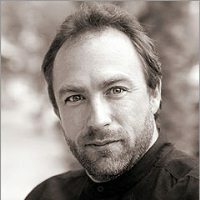 Wikipedia is based on a very radical idea, the realization of the dreams most of us have always had for what the Internet can and should become. Thousands of people, all over the world, from all cultures, working together in harmony to freely share clear, factual, unbiased information… a simple and pure desire to make the world a better place. This is a radical strike at the heart of an increasingly shallow, proprietary and anti-intellectual culture. It is a radical strike at the assumption that the Internet has to be a place of hostile debate and flame wars. It is an appeal to the best within all of us. The result so far has been wild success. Thanks to the wonderful volunteers who have created and managed this vast resource, we are now one of the top 30 websites in the world… and traffic growth continues. The pressures on us increase daily, pressures of organization, of servers and server management. In order for Wikipedia to move forward, we need the help of ordinary people like you, people who share in our dream of a free encyclopedia for every single person on the planet. In 2005, we achieved 6-fold growth in pageviews with spending of less than $750,000. We will need a lot more this year just to keep the site on the air and performing well. But the wonderful thing about our growth is that it gives us a real opportunity to extend our fundraising beyond just what we need to stay on the air. Reporters are always asking me why I’m doing this, why Wikipedians do this? I think you know why. I can’t speak for everyone, but I can speak for myself. I’m doing this for the child in Africa who is going to use free textbooks and reference works produced by our community and find a solution to the crushing poverty that surrounds him. But for this child, a website on the Internet is not enough; we need to find ways to get our work to people in a form they can actually use. And I’m doing this for my own daughter, who I hope will grow up in a world where culture is free, not proprietary, where control of knowledge is in the hands of people everywhere, with basic works they can adopt, modify, and share freely without asking permission from anyone. We’re already taking back the Internet. With your help, we can take back the world. I’m sitting by Matt Mullenweg! Microsoft is trying out a wiki-ish editing process. Hmm, now people have a choice. They can donate their time and energy to a nonprofit effort to make the world a better place by giving away an encyclopedia under a free license. Or they can go to work for free, enriching Microsoft. Indeed. The same could be said of everything that we do around here. “Edit this page” and all that good stuff. Wikinews is our collaborative writing project to report the news on a wide variety of subjects using a wiki. On Saturday, February 5, 2005, 22:00 UTC (timezone conversion), we are having an open IRC chat on how Wikinews can interact with weblogs. If you’re a blogger, and you’d like to know more about how Wikinews works, how you can use Wikinews stories in your blog, and how you can contribute, this is an event you should attend. The chat will take place on irc.freenode.net in the #wikinews channel. Agenda and more information on how to connect: [[m:Wikinews_Chat]] .